Friday morning. Spirit day. Sean says, "Mom! 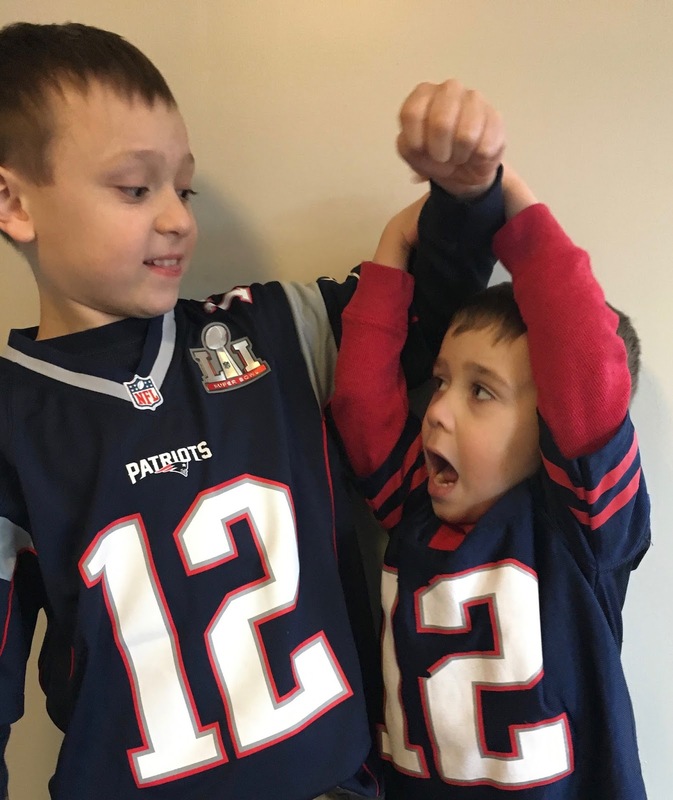 Where's my Patriots shirt?" Finding it in the bottom of the drawer, he put it on and the sleeves ended two inches above his wrist. "Mom, can I please wear it anyway?" 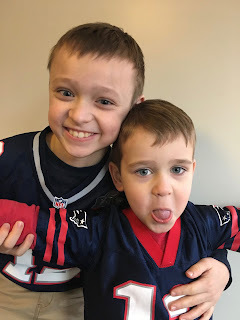 Heading into school with a shirt too small for his growing body, we talked about getting a new Patriots shirt to wear on Sunday. After drop off, William and I visited my Mom for breakfast, then we started our list of errands. Four stores later, we discovered all Patriots gear for kids SOLD OUT! I was becoming weary, and William was losing patience with me. Our last ditch effort to one more stop closer to home brought us to a small sports gear shop in Woburn. We walked in and saw lots of Patriots accessories, but again Patriots shirts sold out. All that was left were the expensive Super Bowl 2017 Jerseys at $75 a shirt! We talked with the young store clerk about the upcoming game, thinking it was just the three of us in the store, I heard another voice say, "Excuse me, but would you buy the jersey if I paid for half?" I peered around the large football display and saw an old man sitting on a bench trying on shoes. 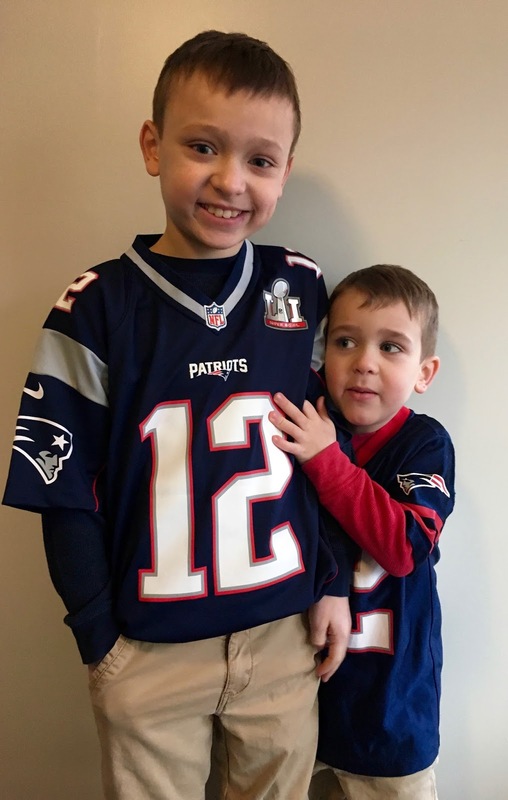 His bright blue eyes twinkled from under his tweed scally cap, his large belly shaking as he smiled, and asked me again, "I'm an old man with nothing but time and money, please let me donate half of the money for your son to have a jersey to wear on Sunday." I looked over at the store clerk, who was beaming from ear to ear, of course my eyes started to well up. I walked over to the kind man, as he proceeded to open his wallet, and hand over $40 cash to the store clerk. Denying such a beautiful gesture would have been a sin. I squeaked out a "thank you", and the tears kept rolling. "Why are you crying?" asked the old man. 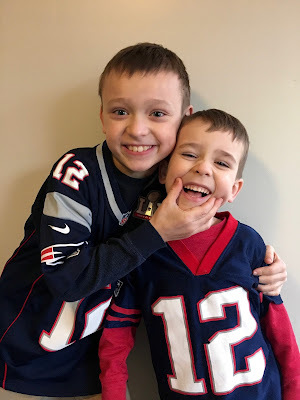 I took a deep breath to compose myself, and started explaining how this is the first Super Bowl without my Dad, and how he would have bought my son a Patriots jersey already in anticipation of Sunday's game. I sat down on the bench next to this sweet old man, I gave him a hug, we exchanged warm introductions and talked more. He asked me about my Dad, his name, and how he came to pass away. It was easy to tell him what happened, and the similarities between this stranger and my Dad became quite palpable. My Dad was a giving man, he was all about my boys. He was also a businessman, and would frequently offer up deals and transactions with me. We had such a genuine exchange of understanding and connection, turning the conversation slowly into a more up-lifting one, "My name is Paul", he said. "I'm a retired dentist from Woburn. I have 8 children and too many grand children to keep up with. What is life without small happinesses in your day? Let me give you this gift in honor of your Dad. A little present from Phil in Heaven." 20 minutes passed before I made it up to the counter to complete the purchase of the Patriots jersey for my son. The store clerk commented on how Paul came in the store all the time, and was a great guy. The clerk proceeded to give me his employee discount, and knocked off another $10 from the jersey! Thanking him too, I ended up paying $20 for a Super Bowl 2017 Tom Brady jersey for my lucky 8 year old son. William gave Paul a high-five, and he received one more hug from me. I left the store with a full heart, a renewed sense of hope for humanity, and the realization that Earth Angels do exist, we just have to stay open to finding them.